q: I wish to delete one of the loyalty accounts from my AwardWallet profile, how do I do that? To delete one of the loyalty accounts from your AwardWallet profile you simply need to first select that account by clicking a checkbox next to it and then you will see a button with a trash bin in the menu, which, when clicked, will delete all accounts that are selected. q: What are Balance Watch credits? Balance Watch monitors a loyalty account to alert you as soon as your balance changes. Points from American Express, Chase, Citi, Marriott, and Capital One don't always post instantly when you transfer them to partner loyalty programs. When you find award availability for a flight or hotel, transfer your points and then use this service to make sure you can confirm your reservation before the availability disappears. Once activated, AwardWallet will check your account frequently and send you a desktop, mobile, and email notification as soon as a change is detected. q: I set up two-factor authentication on my account, however, the code that it generates stopped working all of a sudden? What do I do? First, please double-check that you are entering the correct code. If you are 100% sure the code is correct then it could be a time sync issue. If the time on your laptop is 1:00 pm and the time on your phone where you are generating the code is 1:03 pm, that would indicate a problem. In that case, you should get your phone clock synced and then try again. q: I have too many accounts in my profile, how can I quickly find specific accounts? q: How do I know if the miles I have can be used to fly on another airline? q: I have a lot of loyalty accounts in my AwardWallet profile, is there a way for me to quickly see when each account was last updated? 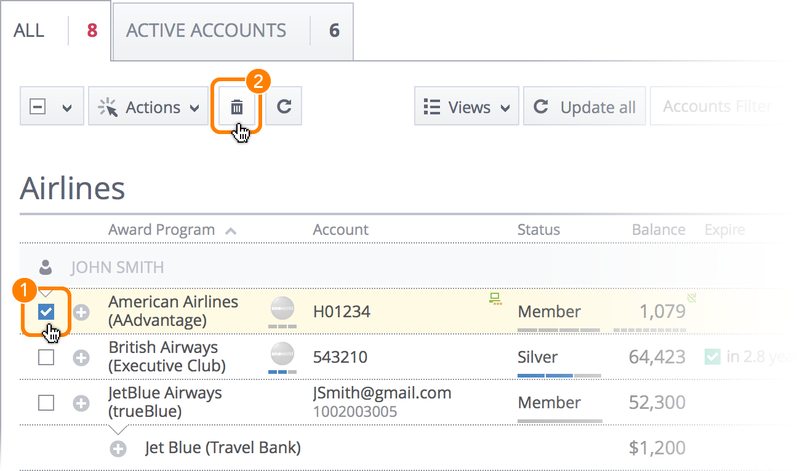 q: How do I know if the miles or points from my last trip have been posted to my account? q: I wish to track loyalty accounts for my whole family, can I do that? q: I choose to store some of my accounts passwords locally on my computer, is there a way to backup them up and then restore the passwords on the same of different computer? q: My husband has his own AwardWallet account, can we share our loyalty accounts using AwardWallet with each other? q: I am a blogger and I wish to write an article about AwardWallet, do you have an affiliate program and where can I grab your logos?